Firstly, you will need to gain access to a ‘Headlamp Alignment’ machine. These can be found at most Vehicle Dealers or Servicing garages and at ALL MOT testing garages. Position your vehicle in front of the alignment machine with the Headlamps switched onto ‘Dipped Beam’ (i.e. No blue ‘Full Beam’ light illuminated on you dashboard). The headlamps will throw a light pattern in the machine similar to the one shown in the diagram below (Areas ‘A’ + ‘B’). 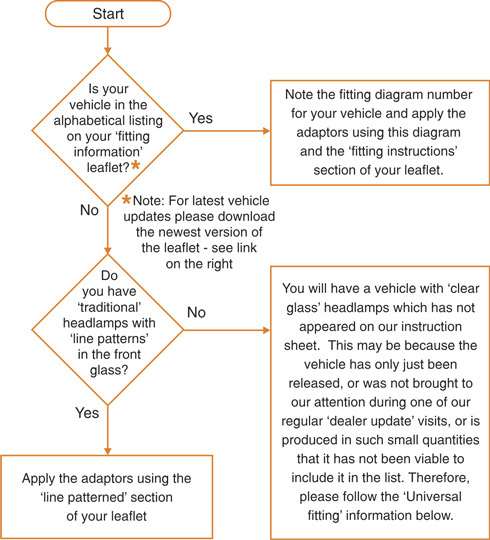 Without removing the backing paper, take hold of the ‘tail’ end of an adaptor and offer the ‘round’ end up to the Headlamp in various positions (see folded leaflet for typical positions  Diagrams 1 - 8 are the most commonly used). The aim is to achieve a reasonable dimming of the ‘dazzle causing Area’ A, without compromising the overall brightness of the headlamp’s beam ‘hotspot’ (Area ‘B’). By a process of experimentation it will be possible to find the optimum position for the Adaptor. NOTE: Ideally, the engine should be left running during this process to ensure maximum beam clarity. Once the fitting position has been identified, the adaptors should be applied using the ‘fitting Instructions’ section of your leaflet. NOTE: Generally, the Adaptor will fit in the same position (NOT the opposite position) on each of the two Headlamps. For example, if the Adaptor fits in the bottom left corner of the Driver’s side Headlamp, it will also fit in the bottom left corner of the Passenger’s side headlamp. We trust the above information will allow you to successfully apply your Eurolites, but please email us at help@travelspot.co.uk if you have any further questions. 1. They use poor quality adhesive  so they easily fall off your headlights  leaving you driving illegally. 2. They are not made from the same high quality material and therefore result in a loss of headlamp beam intensity. 3. They come with incorrect fitting information  so may not fit your car correctly  leaving you driving illegally. a) Eurolites should arrive in either of the two ‘retail’ packs shown below. Note: to keep shipping costs down, and save the environment, many internet retailers use the smaller ‘simplified’ packaging pictured. b) The adhesive ‘backing paper’ on the reverse of the adaptors should be white and printed with a blue or red ‘removal warning’  see image below. 2) Have un-printed yellowy-brown adhesive ‘backing paper’ on the reverse. Send them back to the seller and demand a refund. Report the seller to us so we can investigate and action as necessary. Please remember, Headlamp Adaptors are a ‘Safety Critical’ car lighting product and we all benefit from the product being genuine and working correctly.